Amongst Tim Tingle's many books is Walking the Choctaw Road. Parts of it are heartrending. First published in 2003 by Cinco Puntos Press, it consists of twelve stories, some of which evolved into his picture books. I just came across something I didn't know about. In 2005, the State of Oklahoma's 50th Legislature passed House Concurrent Resolution 1025, commending Tim. I didn't know Tim, back then, but he was already doing important work that was being recognized--in this case, by the State of Oklahoma. A belated congratulations, Tim! For AICL's readers, I'm reproducing the text, here, from the pdf. WHEREAS, Tim Tingle encourages people to make connections through literature and reading by participating in more than 70 appearances at libraries, museums, community centers, and schools throughout the State of Oklahoma from June through November 2005. THAT the Oklahoma Legislature commends Tim Tingle for the honor he brings to the Choctaw Nation and the State of Oklahoma by preserving and writing about Native American cultures. THAT the Oklahoma Legislature commends Tim Tingle for his dedication to literature and recognizes his many contributions to building bridges between cultures and commends his courage, integrity, and commitment to high standards. 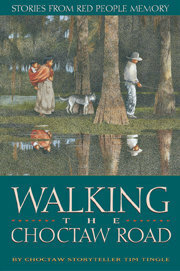 THAT the Oklahoma Legislature urges all Oklahomans to read Walking the Choctaw Road: Stories from Red People Memory and discuss its historic perspective and cultural themes from which we may all gain strength and understanding. THAT a copy of this resolution be distributed to Tim Tingle.